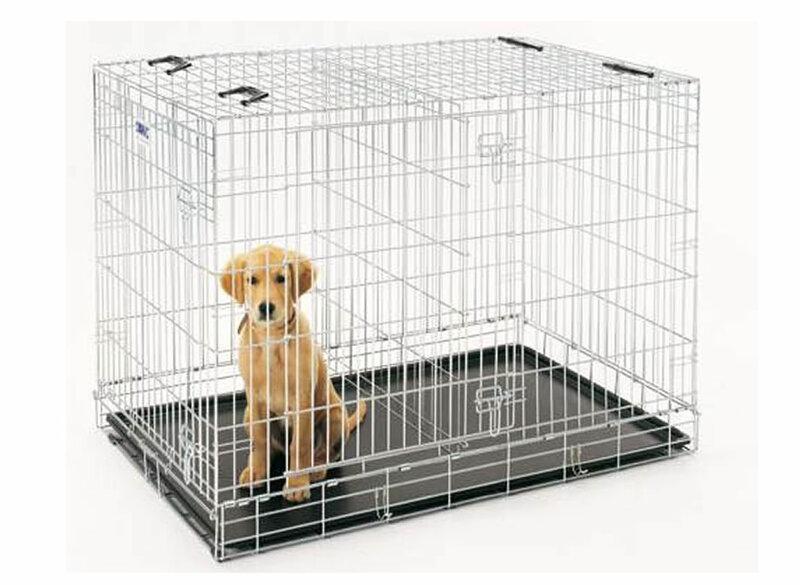 The best crate size for any dog is one which allows it to stand and turn around without restriction. This often means that the crate will have too much extra space for a small puppy. This extra space will encourage the puppy to relieve itself in the crate and defeat the purpose of crate training in the first place. The easiest way to solve this problem would be to simply put a crate divider that can be removed once the puppy grows into adulthood. Listed below are a few tips and tricks to help you make your own divider at home. Before anything else, it is best if you know the purpose of crate training in the first place. Crate training is one of the simplest methods that you can use to potty train a new puppy. The crate serves as a designated area. As such, it should only be large enough to fit a few cushions or a blanket and some food bowls. The puppy should be trained to only relieve itself once it is led out of the crate. However, a large crate will enable the puppy to pee on one end and still sleep peacefully on the other end. 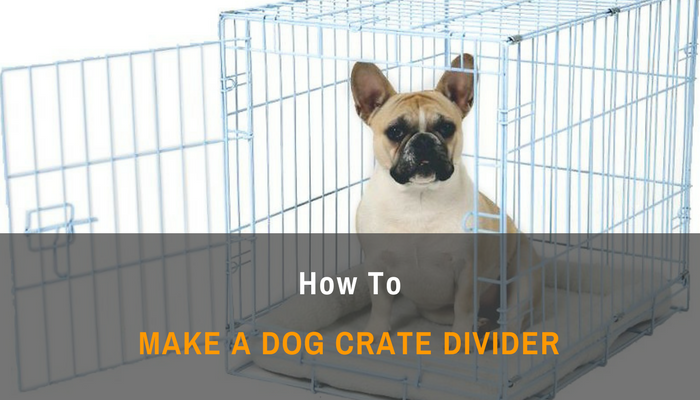 A crate divider can help you restrict the space that your puppy can move around in without forcing you to spend on a smaller crate and buying a new crate every few months. Likewise, a divider can be made using simple household materials that you can easily find at home. A puppy is prone to committing small accidents every now and then while it is being crate trained. For this reason, it is best if you use simple and affordable household materials for your crate divider. Remember that this divider will only be used temporarily so there is no need to spend on a professionally-made divider. If your puppy is in its teething stage or if the breed is a known chewer, it would be better to replace the cardboard with a thin piece of plywood instead. You can simply cut the plywood to the proper size and use a drill or nail to make four holes in each corner. Put your puppy inside the crate to make it easier to determine the appropriate temporary crate size. Make sure that the puppy will still have enough room to move around in in the allotted space. Your pet should be able to stand up, turn around, and stretch out with ease. Mark the spot inside the crate where you want to place the divider. Use the tape measure to get the dimensions of the crate’s interior. Measure the crate from one side to the other to get the proper width. Measure the crate from top to bottom to get the proper height. Mark a half inch allowance to ensure that the divider will fit snugly in place. With the gathered measurements, mark the cardboard or plywood with a ruler and a pen. Cut the cardboard to the right height and width using a pair of sharp scissors. If you have a steady grip, a box cutter can also provide a cleaner and straighter line. The plywood can be cut using a handsaw and then sanded to remove any sharp splinters. Remember that your puppy will be in close proximity with this divider so you should make sure that there will be no sharp edges left that can cause it to injure itself. Punch or drill holes into each corner of the cardboard or plywood. Thread the wire or cable tie through the hole but do not tie it yet. Place the makeshift divider inside the crate and secure it in place by twisting the wires or ties around the bars. Make sure that the sharper ends are secured outside the crate since these can easily injure a curious puppy. You can also opt to cut the excess wires once the divider is in place. Once the divider is in place, your puppy should learn to stay only in the allotted space without pushing against the divider. However, if your puppy turns out to be more destructive than you first thought, then you might consider simply removing the divider altogether to prevent your dog from hurting himself. As your puppy grows, you will find that he will learn not to have any more accidents inside the crate. Most dogs do not enjoy sleeping in their own filth so they will try to keep their sleeping area as clean as possible. In the end, what is most important is that you create a routine that allows your puppy to know when it should eat, when it should sleep, and when it should relieve itself. 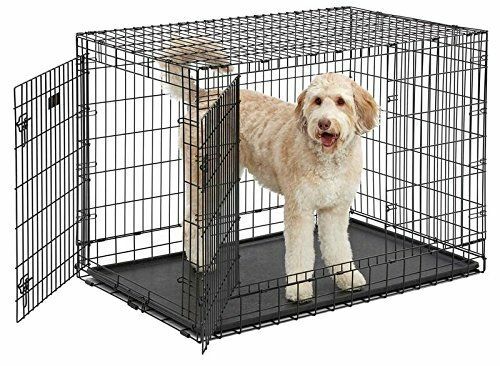 Eventually, once your puppy has mastered this routine, you can then take the divider out and allow the puppy to fully enjoy his crate.